Easily schedule and share content—including video—and engage with your network from a single platform. 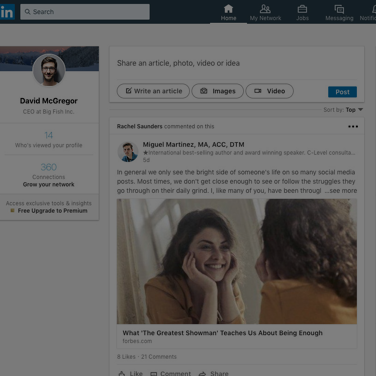 Keep your LinkedIn presence active by efficiently scheduling all your content ahead of time—manually, automatically, or in bulk—all on a single platform. Schedule and publish video right from Hootsuite—according to LinkedIn, videos see five times more engagement than other types of LinkedIn content. Target posts by location, job function, industry, and other parameters and ensure your posts go through the same approval process as the rest of your social content. Track new follower growth, as well as impressions and engagement levels of specific posts, with easy-to-understand analytic reports—all in one place. Monitor what your audience is saying about your LinkedIn content, and quickly respond to comments in Inbox from the Hootsuite dashboard and mobile app.